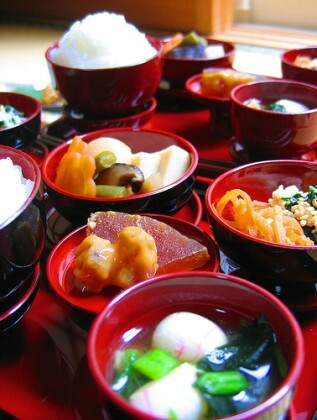 Shojin ryori is a type of cooking commonly practiced by Buddhist monks in Japan. In days before, shojin originally meant zeal in progressing amongst the path of enlightenment or pursuing a state of mind free of worldly thoughts and attachment. In this way, the act of preparing shojin ryori is an essential practice of Buddhism that expresses one’s devotion to religious discipline. What makes the cooking practices of shojin ryori different from the preparation of other vegetarian cuisine? Shojin ryori is based on simplicity and harmony and so the preparation methods follow these principles. For example, dishes are prepared with balance in colors and flavors taking into consideration, so that each meal must have a balance of 5 different colors and flavors. Nutritional balance is central to the preparation of these dishes and in addition, nothing goes to waste when preparing the dishes. Every last piece of each ingredient is somehow incorporated into the meal. Garlic, onion and other pungent flavors are not used in shojin ryori, while standard vegetarian and vegan recipes do not prohibit the use of such ingredients. Why do Buddhist monks follow a vegetable-based diet? According to Buddhist philosophy, all sentient (living) beings have the possibility of attaining enlightenment. In line with this doctrine, the use of meat, fish, or insects is prohibited in the preparation of shojin ryori meals. Is shojin ryori suitable for vegans? Yes. For the most part, shojin ryori is suitable for vegans, since there is limited, if not any, use of egg and dairy products. Historically, eggs and dairy products were very scarce in Japan so it is still not commonplace to use these ingredients. In addition, as all of the dishes are 100% vegetarian, the broths in shojin ryori omit fish as the base and instead seaweed or vegetable are used. If you want to be 100% certain that no dairy products or eggs are used, you can ask the staff. That being said, it can be intimidating when you are visiting Japan especially if you having allergies or specific dietary restrictions and cannot speak the language. If you are looking to try shojin ryori in Japan, it may be beneficial for you to have a private guide or join a tour group hosted by Triplelights in Japan to eliminate the risk of eating something outside of your appropriate diet. What are the common ingredients used in the preparation of shojin ryori? Typical processed ingredients used are tofu and abura-age (friend soybean curd). Goma-dofu (sesame tofu), koya-dofu (dried tofu), yuba (soy milk film), fu (wheat gluten, konnyaku (rum root cakes) and natto (fermented soy beans) are also integral to shojin ryori. Seaweed products such as konbu (kelp), wakame (sea green), nori, and hijiki are used in the preparation of shojin ryori. Vegetables that are in season are utilized and selected based on their ability to provide benefits to one’s body during each of the four different seasons. Vegetables that are seasonal are also selected since they are viewed in Buddhist philosophy as being in flow with nature. Buddhist's believe they grow from the earth during a particular season because they can benefit your body during seasonal changes. For example, summer vegetables such as tomatoes and eggplants are used to cool the body, while fall vegetables such as sweet potatoes and pumpkin give your body energy after the exhaustion caused by summer. Wild plants, such as warabi (fiddlehead fern) and zenmai (flowering fern) can also be found in shojin ryori dishes. What are some common dishes that are part of a shojin ryori meal? Goma-dofu with wasabi: tofu prepared with sesame paste with wasabi (horseradish) on top. Where can I try shojin ryori? The best place to try shojin ryori is at one of the restaurants at a temple. While the prices can be steep for lunch at these temples, the food and experience make it worth your while. The scenery at these places throughout all four of the seasons is a perfect backdrop for your meal. Koya-san: One of the most unique and authentic experiences you can have while visiting Japan is to visit Koyasan, a small town located in Mount Koya. It is the centre for Shingon Buddhism, a religion that was introduced into Japan in 805. At Koyasan, you can stay in one of the temples and experience the life of a monk by staying at the Buddhist monastery and partaking in morning prayers and meditations. You will also be able to experience a strict shojin ryori diet during your time there. Access: Take Nankai Railways from Osaka Namba station to the Gokurakubashi terminal. From there, transfer to the cablecar that will take you up the mountain to Koyasan (5 minutes, 380 yen). Once you reach the top, it is a 5 minute ride by bus to the city center. Shigetsu at Tenryuji Temple: All of the dishes at this restaurant that are set along the edges of the strolling garden of Tenryuji Temple is that they are prepared in accordance with the following flavors (bitter, sour, sweet, salty, mild and hot) and five colors (red, white, black, green, and yellow). 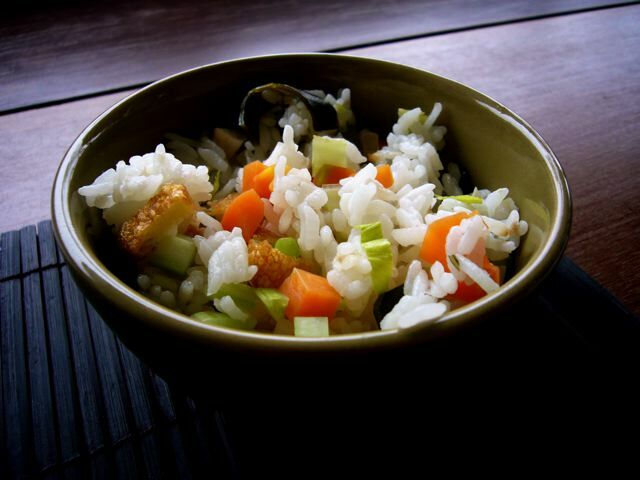 The central ingredients of the dishes include: yuba, tofu and seasonal vegetables. Although the staff does not speak English, the menu is quite straightforward: you have to choose from either 3000, 5000 or 7000 yen options. Access: 5 min walk from Arayashiyama station that is accessible by the Keifuku Arashiyama Line from Kyoto. 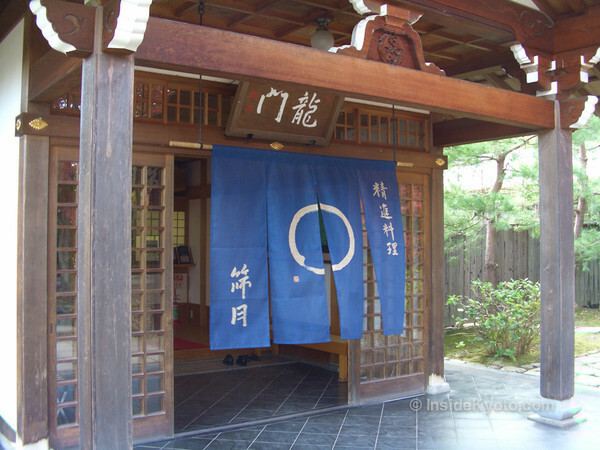 Ryoanji Temple: Read more about this restaurant on our blog article Vegan Eateries in Kyoto. Want to visit Japan and try Shorin Ryori? Whether you need help planning a custom itinerary to include a delicious shojin ryori meal or need help navigating the vast temples of Japan, I recommend checking out Triplelights, as they have over 1,000 licensed tour guides that can provide you with personalized itineraries. All you have to do is check out where you want to go in Japan and then send any of the guides a message for an itinerary and price quotation. If you feel that shorin ryori meals are not for you, don't fret- there's tons of delicious foods in Japan that you MUST try, and you can have the best food experience in Japan if you are guided during a private tour to eliminate risk of getting lost or encountering the language/cultural barrier. Temples are usually reliant on foot traffic, so you will be walking a lot - if you want to visit multiple temples throughout your stay in Japan, I recommend checking out different car tours so that you can navigate faster and maximize the time that you have there for the most enjoyable experience. Lastly, if shorin ryori may not be for you, there are so many other activities that you can participate in, whether it is at temples or in metropolitan cities in Japan, so don't limit yourself and visit Japan! Dai was wonderful during on our customized tour to Tokyo. During the tour we went to Toyota Mega Web, Imperial Palace, Tsukiji fish market, Ueno Garden, and Sensoji Temple. Dai was early to pick us up at the hotel, even though he was sick he provided so much information about Japan and their culture. I wish Dai was available for more dates to provide tours during our stay. Great tour guide! We went on a day tour of Naoshima and Chizuru's knowledge helped us get quickly around and explore the island in the best way possible. She was very friendly and helpful and lovely to spend time with.